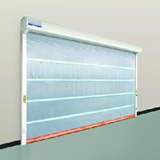 High speed roll up door | Uniflow International Pte. 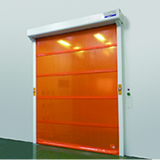 Ltd.
UNIFLOW’S HIGH SPEED ROLL-UP DOORS reduces energy consumption and optimize health and safety management for production and distribution in factories. Our HIGH SPEED ROLL-UP DOORS are produced in our own factories using parts made in Japan, ensuring our products to be user friendly, as well as safe and reliable. UNIFLOW’s HIGH SPEED ROLL-UP DOOR can be customized the dimensions suitable to the sites or providing wind resistant performance and option parts according to every customer’s needs. 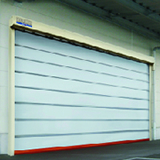 For outdoor installations or where wind-resistant doors are required. For indoor installations or where there is mainly human traffic. Our current high-speed roll-up door ascends up to 2.0 meters per second, which is more than 15 times faster than steel shutters. The rapid sheet movement minimizes user waiting time, which in turn increases work efficiency to accelerate the distribution. Also with substantial reduction in the inflow and outflow of air, higher energy efficiency is achieved. With excellent wind resistance, our roll-up door can reliably operate even in bad weather, without interfering production and distribution. The model with pipes, ‘SMOOTHER’, is recommended for opening exposed to strong wind and/or pressure differences. Food contamination from a foreign substance is mainly caused by insects. Our insect-proof sheet cuts the range of light waves(around 350nm), sensed by insects to prevent them from entering the buildings. UNIFLOW’s HIGH SPEED ROLL-UP DOORS provides the industry’s top-class airtightness. The airtight gaskets hermetically seal gaps between doors to prevent insects and dust. It is designed to withstand 500,000 roll-up/down actions as a standard. Motors made in Japan and other reliable components provide a long service life. Since 1991, we have engineered built and provided our clients with quality roll-up doors. With that experience and capacity to adopt new technologies ahead of others, we hold a key position in the competitive Japanese market. Compatible with voltage specification in Southeast Asia. A wide range of option parts. Our dedicated sales, service and support team will deliver as well as customized solutions for such as type of sheets, sheet windows, switches, sensors, PATLITE, etc. that best suits your specifications. A compact model with maximum opening. A highly wind resistant medium to large model, widely used for both indoor and outdoor. A highly wind resistant ultra-large model, available up to 10m in width. The largest size in the industry. A slim and compact indoor model, suitable for human traffic. A medium-sized indoor model, guarantees smooth and efficient flow of people and / or objects.